Traditional Indian Beautiful cotton Garden umbrella is handcrafted by village artisan in Rajasthan. These Indian parasol are beautiful and complete decorated with Embroidery work. These handicrafts are designed in various multi color combination and are offered in a multitude of motifs, patterns, various other specifications. 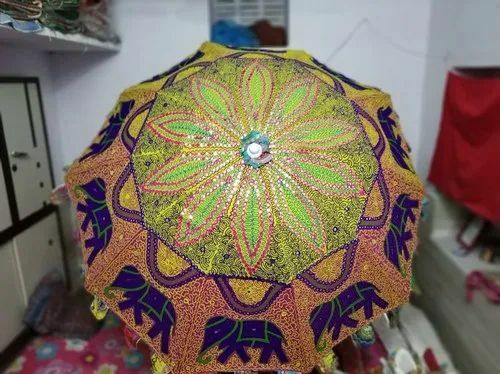 Garden umbrella with hand embroidered , Can't be used in rain(but in bulk order we can made for rain also). Can be used in the beach as well as garden. Established in the year 2009, at Udaipur, (Rajasthan, India), we “Pita Shree Handicraft”, are a Proprietorship Firm, indulged in manufacturing, retailing, exporting and wholesaling a qualitative assortment of Applique Work Curtain, Patchwork Cushion Cover, Patchwork Bed Covers and Sheets, Tapestry Wall Hanging, Handmade Cushion Covers, etc. Under the leadership of our mentor " Mohit Bohra (Manager)", we have been profitably offering quality tested products to the patrons as per their requirements.